Comes with a free gaming backpack. Getting a laptop with Pascal graphics doesn't have to cost a fortune. Case in point, one of today's Shell Shocker deals at Newegg is an MSI Leopard Pro-248 (GP62MVR) laptop with a GeForce GTX 1060 sitting pretty inside for $889 after a $100 mail-in-rebate. Even without the rebate, this is sub-$1,000 laptop that is reasonably well-equipped for gaming. Flanking the GeForce GTX 1060 is an Intel Core i7-6700HQ processor and 8GB of DDR4-2133 system memory—that's a good bit of power for the laptop's 15.6-inch Full HD 1080p (1920x1080) display. Storage chores are handled by a 1TB hard drive. At this price, you could swap that out for a solid state drive and still feel like you got a good bargain. Connectivity on this thing consists of a Killer Gaming E2400 LAN, 802.11ac Wi-Fi, Bluetooth 4.0, two USB 3.0 ports, a single USB 3.1 Type-C port, and a USB 2.0 port. Other features include a 720p webcam, Steel Series keyboard with backlight, four built-in speakers (2W), a headset amp, mini DisplayPort and HDMI video output, and Windows 10 Home 64-bit. All this comes in a fairly thin and light chassis measuring 15.07 x 10.23 x 0.86-1.14 inches (WxDxH) and weighting 4.8 pounds. 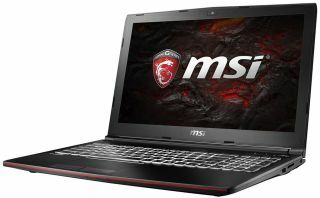 You can grab the laptop on sale here, with a free MSI gaming backpack for 15-inch to 17-inch notebooks thrown in to boot.